Every February Plumtopia celebrates the romances, great and small, in the work of P.G. Wodehouse, to mark the anniversary of his death on St Valentine’s Day, 1975. Guest contributions are warmly welcomed, and this year I’m thrilled to share a series by guest author Jon Brierley on the 1921 Wodehouse novel, The Adventures of Sally. Jon is sound on Wodehouse and has written wonderfully in the Wodehouse style at his blog, Sloopjonb: Writing Wibble (try his Jeeves’ Christmas Carol). Jon is currently putting the finishing touches on his first novel and would love feedback from beta readers. Please do visit his blog to find out more. 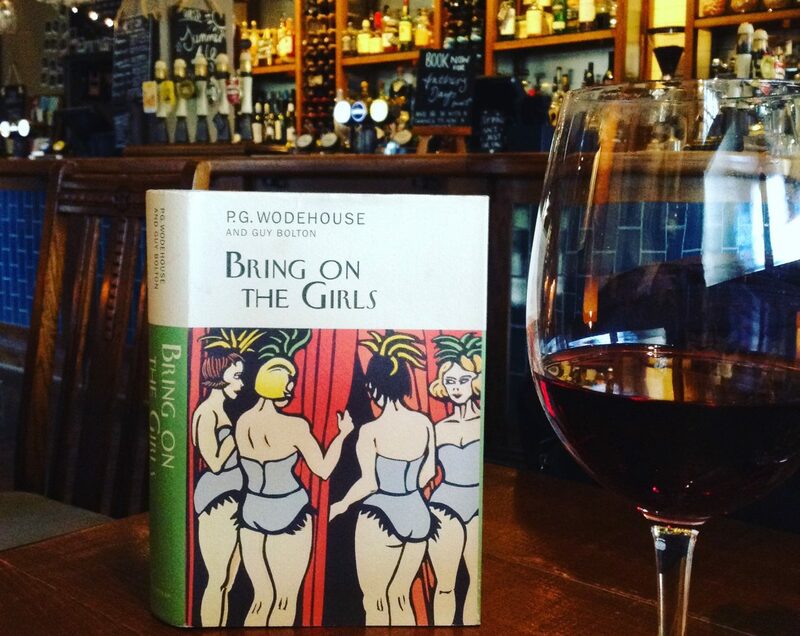 Most readers of Wodehouse know him as a farceur, a humourist, a deliverer of reliably funny froth; they will revel in Jeeves and Wooster, quote delightedly from the Blandings saga, and may even run to snippets of Psmith. The true devotee of Wodehouse, however, knows that he had a lengthy career in other literary genres before he settled on his final winning formula. He began his novel-writing life penning school stories, entirely conventional if superior examples of the breed (until the radical intervention of Psmith), but also branched out into comedic (but not farcical) romances, apparently on the grounds that these sold better. The Adventures of Sally (American title: Mostly Sally) is one of these, first serialised in Collier’s magazine in 1921, and it is to the romantic adventures of the titular Sally Nicholas that we will now turn our attention. The plot and settings of Sally brought together several strands of Wodehouse’s life; he was still heavily involved in the theatre, and like Sally herself was almost commuting across the Atlantic in pursuit of his various interests. In his early days in America Wodehouse had lived in many seedy boarding houses not unlike Mrs. Meecher’s, and, like Ginger, had played Rugby football and been unable to go up to Oxford due to a family financial crisis. The story itself is something of a re-tread of an only slightly earlier novel, Jill the Reckless, featuring the common elements of a theatrical background, trans-Atlantic hopping and the losing and gaining of both fortunes and fiancés. One wonders whether this repetition is due to pressure of time; maybe Collier’s needed something quick to cover a gap, and Wodehouse was unable to fashion something entirely new. Whatever the reasons, and whisper it quietly, it has to be said that Sally is not one of Plum’s best. The pacing is all off; half-way through Sally decamps to England, and recounts her adventures there in a series of letters to Ginger back in America. Whilst these are amusing, they slow the story down, especially when she visits a Rugby international game at Twickenham, an episode that must have mystified American readers. Elsewhere several important events take place off-stage, and are inadequately reported, giving the impression of a story struggling to find the right gear, and proceeding in a series of jerks. And at the end, the denouement develops with almost indecent haste, as if Wodehouse had been told the serial was ending next week, and he had to tie up all the loose ends too quickly. Jon Brierley’s piece will continue through February. While you’re waiting for part two, why not add The Adventures of Sally to your Wodehouse collection ? What Ho, Jon. Hope you’re happy with the first instalment. I think I have read this one, many years ago, but shall go back and refresh my memory. A good analysis from Jon – I think Plum was perfectly happy to work things out ‘in public’ as it were, in his early years, and wasn’t too bothered about any shortcomings; I quite envy the confidence of republishing ‘a better version’ of ‘Love Among the Chickens’, for example, some years later! I think the transition from magazine to book publication probably encouraged further development of his own work. These days, authors must strive to create the perfect novel first time. Woops. I was on a bus and my comment was posted while I was still pondering it. You get the drift though. You’re supposed to be there with your notebook a la Plum not ignoring all that potential copy! Sally’s pluck and entrepreneurial instincts could teach quite a few things to business ventures which are referred to as ‘Start-ups’ these days. My word, yes! An excellent point.